A former police sergeant has told a jury he could not recall any discussion about the consequences of opening an exit gate at Hillsborough, allowing Liverpool fans into the ground. Michael Goddard said match commander David Duckenfield made the order after three requests from an officer outside the ground as the crowd swelled. It was the first order he had given that day, Preston Crown Court heard. 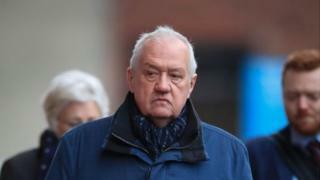 Mr Duckenfield, 74, denies the gross negligence manslaughter of 95 fans. Mr Goddard told the court he was working as a radio operator in the police control box at the April 1989 FA Cup semi-final alongside Mr Duckenfield, of Ferndown, Dorset. Roger Marshall, the superintendent in charge outside the Leppings Lane turnstiles, made three radio requests to open gates to allow fans into the ground as crowds grew outside, said Mr Goddard. He said there was a brief discussion between Mr Duckenfield and ground commander Bernard Murray about whether non-ticket holders would get in to the stadium but they gave no response to the first two requests. He told the court the third message from Mr Marshall "wasn't a request, it was a demand, basically, open the gates". He said: "Mr Murray turned round to Mr Duckenfield and said, 'do we open the gates? ', and he immediately replied." He said Mr Duckenfield said: "Yeah, open the gates." Mr Goddard told the court that was the first order Mr Duckenfield had given that day. Richard Matthews QC, prosecuting, asked: "Was there any discussion about what consequences there might be of opening the gate and letting in a large number of people?" Mr Goddard replied: "Not that I recall." He said the gate was opened within seconds of the order and the "majority of people" who came through headed towards the tunnel that led to the central pens.